In all of the travels we’ve done, South Korea remains one of our favorite countries and Seoul one of our favorite cities. The people, the culture, the landscape, and the FOOD. Oh my word, the food. It’s all amazing. 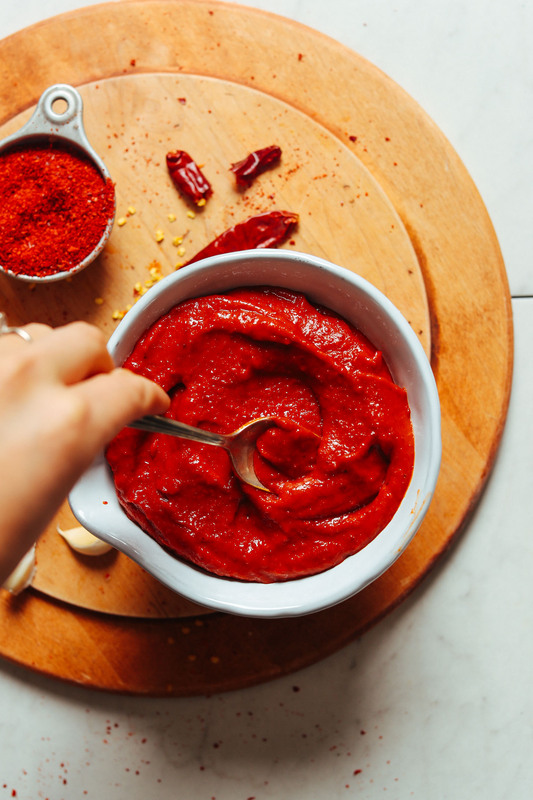 We’ve shared an inspired version of easy kimchi on the blog before, but recently, we were craving that quintessential red pepper paste known as gochujang. It’s spicy, savory, and slightly sweet with so much complexity. 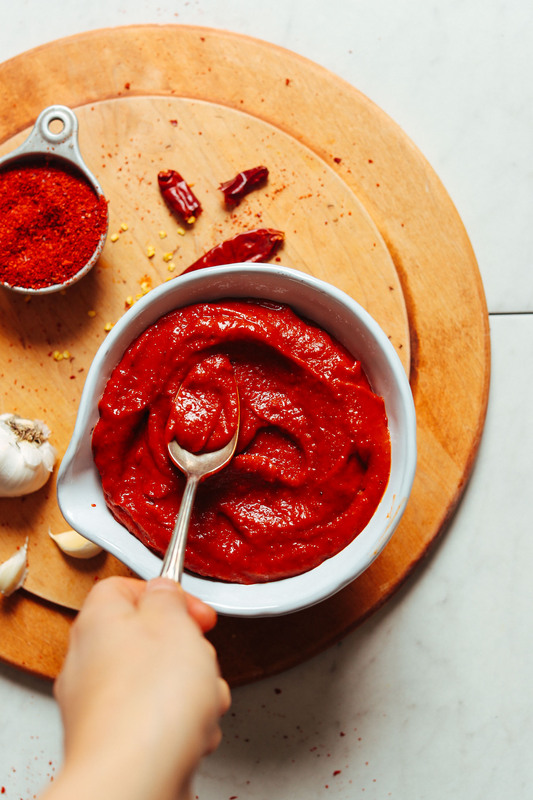 Traditionally, the sauce is made and fermented to develop the flavors, but there are also ways to make it more simply (and quickly) – which you know we’re all about. This is my inspired version (not authentic, mind you!) of this curiously complex sauce we’ve grown to love and crave. Let’s get started! First of all, this recipe is EASY. I mean easy. Anyone can make it. It requires 5 ingredients, 5 minutes, and 1 blender or food processor. It starts with miso as a base, which provides a quicker route to that fermented flavor. Plus, we like using chickpea miso to avoid the possibility of GMO soy. But if you can only find soy miso, that works, too! The flavors are quite similar. Next comes Korean chili powder or flakes, which we’ve discovered are quite different than other chili flakes. They’re not as spicy as cayenne and more complex than red pepper flake. If at all possible, order some online (link in recipe) or visit an Asian store in your area to see if you can hunt them down. For more flavor, we added some fresh garlic, maple syrup for natural sweetness, and coconut aminos in place of soy sauce for saltiness and depth of flavor. Swoon. What can you use this sauce on? So many things. First of all, it acts as a chili paste in marinades and sauces. Anywhere a recipe calls for chili garlic sauce, you could experiment substituting gochujang for more complex flavor. Bonus: We have a recipe coming soon to show you exactly how we put it to use. Stay tuned! The cool thing about gochujang is it’s not spice-your-face-off spicy. It’s more of a subtle spice because it’s balanced with other flavors. Plus, you can control the spice level when you make your own! So even if you’re typically averse to spicy food, give this one a try! You might be pleasantly surprised. Use this sauce in our Gochujang Spiced Cauliflower Wings to see what we’re raving about! If you’re into Korean food, also be sure to check out our Easy Kimchi recipe. And for instant inspiration for where to use this sauce, give it a try in our Marinated Peanut Tempeh or add it to the dipping sauce in these Collard Green Spring Rolls! If you like this recipe, let us know! Leave a comment, rate it, and don’t forget to tag a photo #minimalistbaker on Instagram. Cheers, friends! Easy-to-make Korean-inspired Gochujang sauce that's vegan, gluten-free, naturally sweetened, and soy-free! Just 5 minutes, 5 ingredients, and 1 blender required. 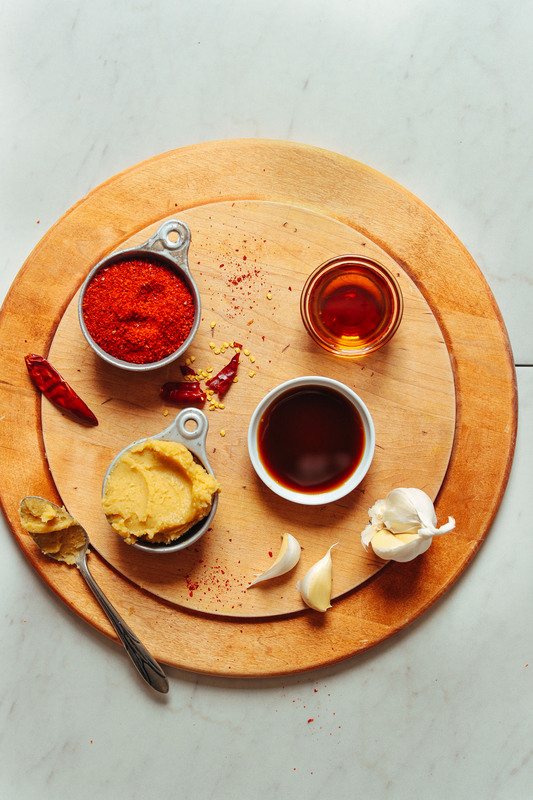 To a small blender or food processor, add chickpea miso, maple syrup, chili flakes, coconut aminos, and garlic. Blend together until smooth, adding water to thin into a paste (see photo for texture). Taste and adjust flavor as needed. Add more pepper flake for spice, coconut aminos for depth of flavor, maple syrup for sweetness, garlic for “zing,” or salt for saltiness. Store in the refrigerator up to 2 weeks or in the freezer up to 1 month. Perfect for use on dishes like tempeh, cauliflower wings, sauces, marinades, etc. 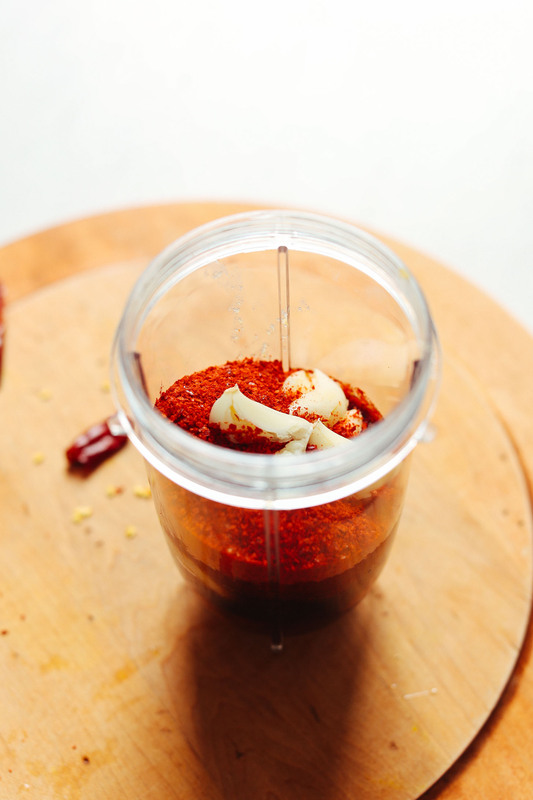 *If you can’t find Korean Red Chili Powder, feel free to replace it with something similar such as cayenne or red pepper flake. The flavor and spice level will vary, so adjust accordingly, especially with cayenne, which is much spicier (start small and add to taste). *Recipe adapted from Leite's Culinaria. Would this ferment if I left it in the sun for a few hours a day the way it’s done with traditional gochujang? Hi Saira, we haven’t tried that and can’t say for sure. If you give it a try, we would love to hear how it goes! I just discovered this amazing sauce when I purchased a salad kit from the store. What would be best to thin the sauce for a salad dressing. Excited to try this! We haven’t tried that, but think lime juice, maple syrup, and water might be a nice combo! Oh dear, I used the tamari & forgot to cut the amount. Any suggestions to reduce saltiness? Sorry to hear that happened! You could try doubling all of the other ingredients and then taste testing and adding more tamari, if needed. Hope that helps! @Tida: Gochujang is vegan. 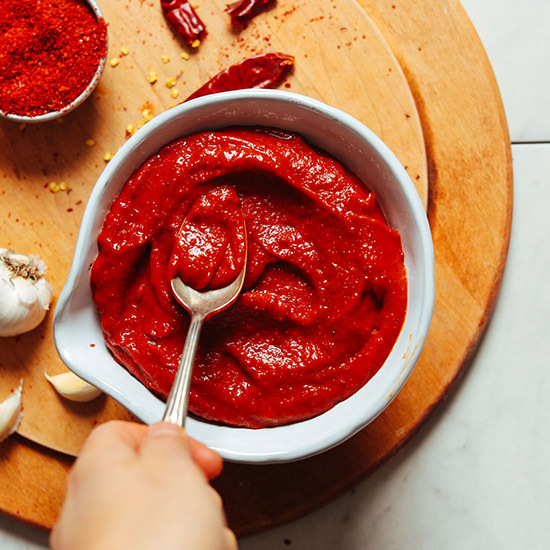 There are many gochujang-based recipes that contain additional ingredients, as @Xissy mentioned, but if you purchase gochujang from any store, it will only contain plant-based ingredients. I just made the sauce and was wondering if I should have made any modifications since some of my ingredients were just a little different. I used Braggs liquid aminos and regular miso paste.. wondering if that made it a little too pungent in flavor it was very salty. Or is this how it’s supposed to taste? Also added some fresh ginger and lime juice to help liven up the flavors a bit which deffinatly helped! Thanks!! How spicy do you think this sauce is for a spicy-foods wimp? Do you think I could sub samba oelek for the Korean chili flakes? Hi Kat! It’s more of a subtle spice because it’s balanced with other flavors, but if you give that a try, let us know how it goes! Hi there, I am super excited to try this.. Can I use Tahini in place of miso paste? I am not sure that would produce the same results as the taste would be different, but if you experiment with it, report back on how it goes! Good luck! Can you use soy sauce instead of coconut aminos? I don’t have tamari or coconut aminos. Would rice miso work in this? Hi, can I just ask wha the reason is for you useing soy alternatives? I used to love the Korean Ribs at the Sushi Bar but now that I am a plant based eater those are no more and then…. You came to the rescue again! I just made the sauce and the cauliflower wings are in the oven!! The sauce is sooo yummy. The smell of the Korean Chilis alone had my taste buds dancing. Thank you again. Can’t wait incorporate this sauce into other dishes. Eggplant paninis perhaps. Just made it. It’s yummy. Going to make the cauliflower recipe you posted and maybe try it on the pizza I was going to make too! I would give this recipe 6 stars if I could. I used this recipe to make the cauliflower wings and holy moly were they delicious. Modifications that I made: I used soy miso, just less than 1/4 cup of maple syrup, and just over 1/8 cup of soy sauce in place of the coconut aminos. I shared this recipe with all my girlfriends because what kind of friend would I be if I didn’t?? Glad you loved the sauce, Liza! Thank you for sharing your subs. Thank you for turning me on to the sauce! I liked the taste a lot, but somehow I messed up this recipe. My cauliflowers were drowning in a pool of liquid when I pulled them out, so they werent crisp like shown in your post. Not sure what i did wrong – maybe I’ll try putting the sauce on last and not putting it back in the oven next time? You have no idea how excited I was when I saw this recipe pop-up in my inbox! My hubby’s a HUGE fan of Korean food but I have a soy allergy and our daughter’s gluten-free so trying to find an option for us has been impossible. Until now! Seriously cannot wait to try this recipe. Thank you! Just a practical tip. I HATE cleaning out my blender…so for many blended sauces I use a wide mouth mason jar and an immersion blender. I tare the jar on a kitchen scale and weigh/pour measured ingredients directly into the jar then blend away. Then I can easily put a lid on it and store in fridge. I do this with so many things: crepe and pancake batters, salad dressings, marinades, etc. My only qualm with this is That I had korean red chili powder that my DH brought back from korea while on business but it had no english on the packaging and hope it it does not include MSG. what kind of small blender did you use? We use this blender, and this food processor! Hello! i would love to make this, but I can’t have any sweeteners besides stevia and small amounts of 100% fruit juice. What would you recommend i sub the maple syrup for? More water and a little stevia? Thank you! Hmm we haven’t tried and can’t say for sure, but if you give it a try, let us know how it goes! I LOVE LOVE LOVE Gochujang! It is my favorite Korean sauce by far. Goes well with everything! I just love how ridiculously easy and vibrant this recipe is! Thank you Dana. I love your recipes and find your website one of the easiest to use. You have a gentle, open style that makes Your recipes so useable. And you respect the no salt or oil crowd. I also appreciate that you include recipes that are soy free and gluten free. Just recently started experimenting with vegan foods, but so many are centered around wheat (saitan) and soy. Thank you for researching and providing alternatives! How long will it last this recipe in the fridge? On the conservative side, at least 2 weeks. But honestly, probably closer to 1 month. This is SO good! Just made this and it’s going on our tofu bowls tonight! Thank you! Yay! Thanks for sharing, Morgan! I’m going to try this because I love this sauce but had no idea what was in it. If using soy bean miso, I am assuming white miso is to be used? Not sure if you are vegan or just engage in vegan recipes. Would you ever share or blog the places you have been? Planning on a korea trip, but both me and my partner are vegan and are wondering how hard it is to eat? There are vegan restaurants in itaewon. You can also find vegan restaurants in Korea videos on youtube. Also follow Megan Bowen, she is an expat living in Korea and is a vegan. Korea is fairly easy to navigate as a vegan if you stay in the big cities and you can stock up at a vegan store like the one in Seoul and take stuff with you where ever you go! Good luck! I cannot wait to make this gochujang! 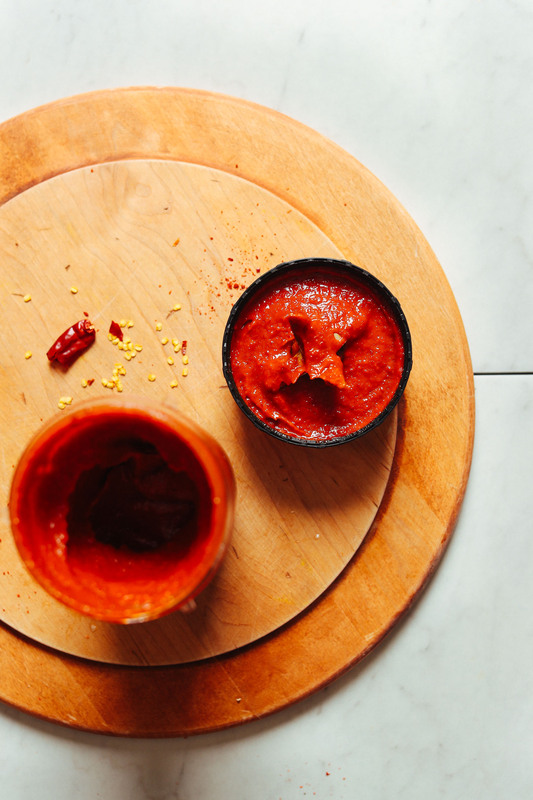 Up next, recipes for ssamjang and ssam…the most amazing sauce made from gochujang and my favorite meal! Ooh, thanks for sharing! Never heard of those but am going to research immediately! YAY!! I have a giant bag of the Korean Chili Flakes and didn’t know what to do with them. (Bought them to make Kim Chi which ended up literally exploding in my dining room and haven’t had the courage to try again!) All I need to do now is buy Miso. What are the odds? Hope you love it! I do love your genius!!!! Oh my gosh, thank you! Most commercial gochujang is not gluten-free. This has opened up a world of possibilities. Right? So stoked to have a soy-free and gluten-free version! I recently bought a tub of gochujang, but was just thinking I could probably make it myself. So happy to see this pop up in my inbox! The ingredients in most commercial gochujang pastes are pretty awful. Agreed, that’s why I wanted to try making my own! Love this easy version – hope you do, too! I will try it pretty soon, and will leave my comments. Thank you! They do this with marinated chicken from the sauce, red onion, mozzarella, provolone, carrots, red peppers, drizzle sesame oil and after baking add cilantro. Good, spicy Korean chicken pizza!